First my apologies for not having written a newsletter for quite sometime but life is very chaotic at present with not enough hours in the day. Being asked to join Spellbinders as an International Ambassador was the main highlight of last year and this year it has taken off ten fold. It was the best thing I ever said Yes to and how my life has changed. Another thing I have committed too is joining the Design Team for a new UK company called Craft Stash. Their aim is to be one of the largest on line suppliers of craft items and things are going really well. If there is anything that you wanted to find out about the dies that you have then drop me a line and if I have the die then I will hopefully give you some new ideas on how to use it. There are lots of new dies coming onto the market and of course many of them are also being retired. I have no control over which dies stay and which dies go so please don't shoot the messenger !! 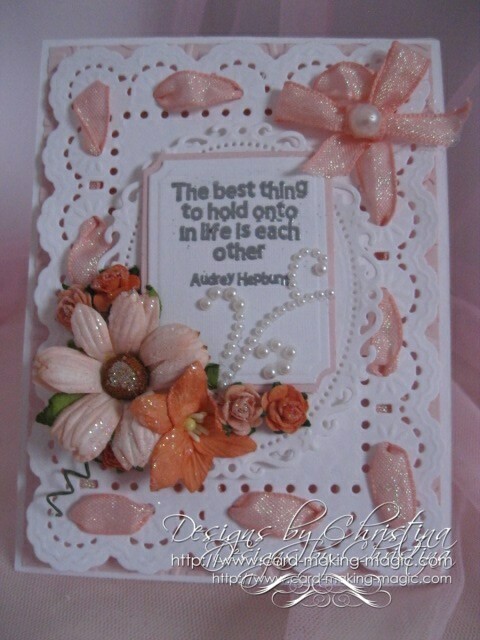 Each week on the blog pages I also give away one of the cards that I have made. I actually gave away ten pink cards one Friday to ten winners. You will need to pop over there to enter for that but please remember that you can add any of your projects to the Gallery pages here on the website. Leave me some details of how you made the card so that others can make it too. I need more than one line to be able to add your cards. So please add in some detail or the card will not be accepted. Tell us the size of the finished card ... what you used and how you embellished. Which technique have you used on the card and who did you make it for ... just some of the things you can include in your submission. One of the exciting things we have been doing over the last week is redesigning my work space. I was running out of storage and so my "Film Crew" has donned his builders hat again and made me a mobile storage unit that can be moved around. It has made such a difference to the craft room. We have also bought some lighting to improve filming and so we are going to start making more videos to add to the website. I hope you will take the time to view them and I hope that they will help you to create some beautiful cards in the future. My YouTube channel has grown to 26,666 followers and they have viewed the tutorials 5,194,417 times.